With canned tuna, which is in the box or glass jar, oil or natural, you can prepare many dishes, almost all very simple: from the beautiful salads until the fresh uncooked pasta sauces and many other yet. To emphasize even more the taste of the sea, I also added a salted anchovy, clean to get two fillets. The preparation is quite quick and definitely simple. Clean anchovy salted to obtain two fillets and set aside; if you do not use them immediately toss with a film of oil. Peel and crush a clove of garlic with a knife blade plate. Keep them aside for a moment and prepare the other ingredients. ... add the coarsely chopped onion, after a couple of minutes put the tuna already drained in oil or preserving liquid in the pot, chop the capers coarsely with the knife and just add them to the rest, stirring to mix everything. Sprinkle everything with the white wine, raise the heat and let it evaporate, pour the tomato and then the concentrate. While the tomato goes to a boil, add salt and pepper, add the oregano crumbled in the palm of his hand, and immediately put the lid boiling and cook over medium-low heat for about 20 '. If the sauce thicken too much, add a little 'hot water or vegetable broth. 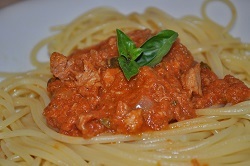 After cooking time, the meat sauce is ready to season the pasta; possibly already seasoned with a little oil. A basil leaf is certainly welcome! ... and remember to remove the garlic clove at the end! In my opinion, a sauté of vegetables mortifies the aroma of tuna and anchovies; but if you want you can use it by preparing it with garlic and then adding only the anchovy. Beware, however, to reduce the amount of onion: otherwise you would find a vegetable sauce flavored with tuna! In this dish does not use parsley but generous sprinkling of parsley into the sauce, to fire off looks good absolutely. Even if it is flavored pasta in a bowl before serving, drain and pour the hot soup bowl in which it has already put the olive oil and plenty of parsley, mix well and then season it with the sauce. The vegetable stock, neutral but tastier than water, can be used without remorse to dilute the sauce if it thickens too much.